I’ve been asking around a lot lately for reading recommendations inside the Marvel Unlimited app. I’ve taken some great suggestions from many of the other Earth Nerds in our Slack channels, as well as a few from the growing community of our comics-focused Nerds on Earth-616 Facebook Group. The binging has taken me through Whedon and Cassaday’s Astonishing X-Men run and populated my Library with more Star Wars titles than you can shake a kyber crystal at. Recommends the best X-Men series, arc, and issues to look out for. Cautions me to avoid the worst of the same subset of Marvel Comics. And in the very first episode, I was surprised not only to hear the name of a very oddball and relatively obscure Marvel comics character, but also to hear hosts Zachary Jenkins and Adam Reck highly recommend I read a single issue in which he stars: Wolverine and the X-Men #17: Wolverine’s Secret Weapon starring Doop. So I pulled up Wolverine and the X-Men and got to reading…and it earns its every accolade. What Does Doop DO, Exactly?! The comic opens up with a bit of a progress report form Deathlok on the current staff of the Jean Grey School for Higher Learning. Overall, the staff seems to be doing a great job, but there is one member of the faculty that has no title or responsibilities that Deathlok can determine: Doop. Wolverine assures him and the rest of the staff that Doop is there at his request and that he performs a “vitally important function” at the school. The pages then transition to a flashback of Wolverine convincing Doop to come onboard, and progresses through a series of increasingly more demanding and hilarious tasks Doop requires of Wolverine before he’ll even consider taking on the job. 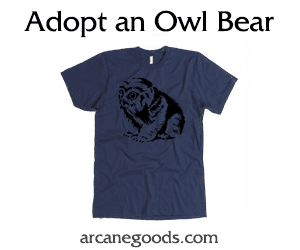 And I won’t spoil it here, but the last one is downright LOL-inducing! After accepting the gig, the rest of the comic is a series of vignettes revealing just what that “vitally important function” is: Doop is to identify and eliminate threats to the school before they get to the school’s doorstep. This has him tackling problems ranging from the League of Nazi Bowlers to the Westchester County School Board to Robo-barbarians from another dimension (featuring a cameo by none other than Howard the Duck! ), and even a nun who appeared to be writing a bad review of the school on Yelp (my personal favorite). He even travels back in time at one point to save the progenitor of the entire Xavier family line from Wendigos in 1652. All of which explains why the poor floating green half-man always appears to be sleeping on job: He’s exhausted, not lazy. Writer Jason Aaron seems to have been given free license to just have fun with an issue when it came to Wolverine and the X-Men #17. The issue is bonkers from beginning to end with lots of laughs via absurdity. 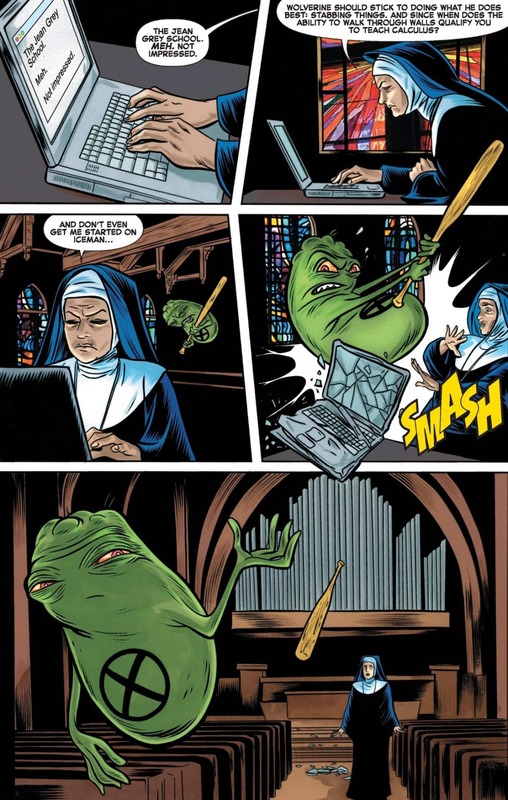 And Doop co-creator Mike Allred along with his wife, Laura, are brought in for this issue to bring the silliness to life on art and colors respectively. They keep the visuals very cartoony and bright, which serves the tone very well. Out of curiosity, I also looked up a Doop translator for the issue to make sense of his speech balloons (he speaks an alien language that goes untranslated in the comics, but has an official translation key). While not necessary for enjoyment, I did find that his lines were just as comedically engineered as everything else in the issue, so its well worth reading along with this page-by-page translation. 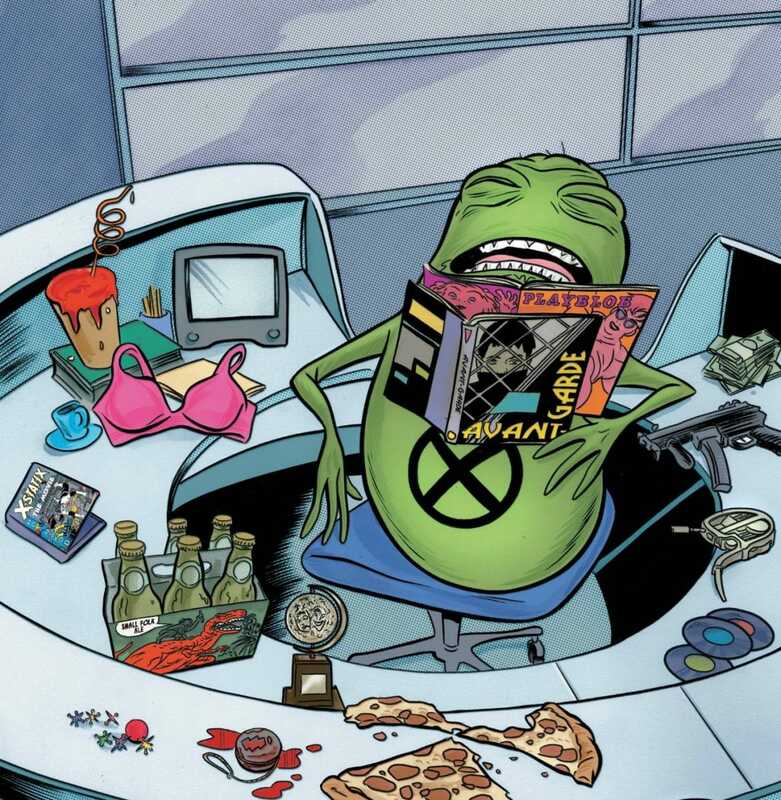 You don’t have to read any issues preceding #17 in this run or be familiar with Doop at all to get a kick out of it. This might well be the funniest Marvel Comic I’ve ever read, and I highly recommend checking it out, for sure!